Some of the nationÕs most prominent spine surgeons hailed it as a medical breakthrough. Calvin Timberlake's artificial disk failed and had to be removed. 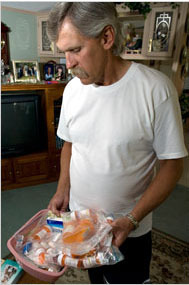 He takes medication to control pain and is suing the maker of the device. In a study of nearly 240 patients with lower back pain , the doctors said that the Prodisc, an artificial spinal disk, had worked much better than conventional surgery in which patientsÕ vertebrae were fused. ÒAs a surgeon, it is gratifying to see patients recover function more quickly than after fusion and return to their normal activities more easily,Ó Dr. Jack E. Zigler, a well-known spine specialist and one of the studyÕs lead researchers, said in a 2006 news release announcing the latest results of the Prodisc clinical trial. As it turns out, Dr. Zigler had more than a medical interest in the outcome. So did doctors at about half of the 17 research centers involved in the study. They stood to profit financially if the Prodisc succeeded, according to confidential information from a patientÕs lawsuit settled last year. The companies behind the disks and the surgeons who were willing to comment say the researchersÕ financial interests had no impact on findings of the research, which they say have been published in various peer-reviewed medical journals. The Prodisc, used on thousands of patients, has been shown to benefit many people with back pain, they say. It is unclear, however, whether the diskÕs maker fulfilled its legal obligation to inform the Food and Drug Administration of the researchersÕ financial interests before it used the studyÕs results to approve Prodisc in August 2006. Synthes, the current manufacturer, said it would not comment on whether the F.D.A. had been fully informed of the researchersÕ interests. The F.D.A said it was investigating the matter. The way the Prodisc was tested and approved provides a stark example of conflicts of interest among clinical researchers Ñ conflicts that are seldom evident to doctors and patients trying to weigh the value of a new device or drug. Instead of serving as objective gatekeepers who can screen out potentially harmful or ineffective new devices or drugs, some medical experts say, clinical researchers with conflicts may have incentives to overstate the value of a new product for patients. One Prodisc study patient who says the surgery left her worse off, Patricia Kennedy, asserts her surgeon Òseemed more concerned with the prospects for the Prodisc than for her medical care,Ó according to the lawsuit settled on undisclosed terms last year. The surgeon, Dr. Richard A. Balderston, who practices in Philadelphia, was one of the researchers with a financial interest in the disk. He referred questions to his lawyer, J. Scott Kramer, who declined to comment. Ms. Kennedy and her lawyer also declined to comment. And many of the Prodisc investor-researchers are now focusing their attention on newer spinal devices Ñ often for companies with whom they also have financial ties. Dr. Zigler, for example, is a researcher for a new spine-stabilizing device made by Applied Spine Technologies, where he serves as a paid member of the companyÕs scientific advisory board. ÒAll of this is based on time,Ó said Dr. Polly, who estimated that he spent two or three weekends a month consulting or working with other doctors for Medtronic. The rate he gets from the company is less than he would make testifying or working on medically related legal issues, he said. Dr. Charles Rosen, a spine surgeon at the University of California, Irvine, was not involved in the Prodisc trial. But he provided his expert opinion to Patricia KennedyÕs lawyers and has reviewed the medical records of some of the other patients who are dissatisfied with their treatment. He is among a growing number of specialists who say the relationships between some prominent spine surgeons and the device industry have become too cozy. ÒIndustryÕs goal is to make a profit for its shareholders, not to advance medicine,Ó said Dr. Rosen, who in 2006 saw a need to start a group called the Association for Ethics in Spine Surgery. It now includes 85 specialists who say one of their aims is to warn the public about industry influence on medical practice. Anthony Viscogliosi, one of the three brothers running the firm, served as Spine SolutionsÕ founding chief executive and its chairman. The Viscogliosi firm operated a number of investment funds whose main asset was Spine Solutions. Dr. Zigler, a spine surgeon at the Texas Back Institute, was the first doctor in the United States to perform the disk surgery in October 2001. Texas Back, widely considered one of the nationÕs leading private practices in spinal medicine, has been among the most aggressive in advocating new devices like artificial disks. Dr. Zigler and the Texas Back Institute declined to comment except through a statement attributed to Dr. Zigler. ÒThe integrity of clinical research trials is core to the successful advancement of spine and neck care and at the heart of Texas Back InstituteÕs commitment to provide leadership in the field,Ó it said, in part. The hospital says that it no longer invests in companies whose products it is researching but that patients participating in the Prodisc study were told about the hospitalÕs and Dr. CammisaÕs financial interests. Through a hospital spokeswoman, Dr. Cammisa declined to comment. 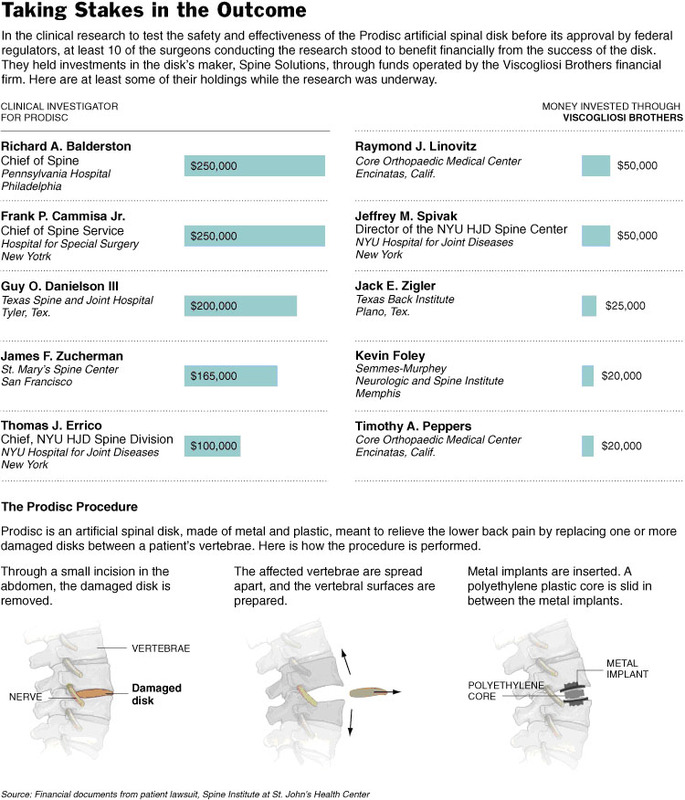 Other prominent spine surgeons involved in the Prodisc research who also invested at least $100,000 with Viscogliosi Brothers included Dr. Balderston, Dr. Thomas J. Errico at New York University and Dr. James Zucherman at St. MaryÕs Hospital in San Francisco. The F.D.A.Õs rules allow clinical investigators to have financial ties with the maker of the device or drug they are studying Ñ on the condition that such relationships are fully disclosed. Lawyers who have worked with the F.D.A. say that when it becomes aware of potential conflict, it tends to subject research to a higher level of scrutiny. In early 2003, the Viscogliosi Brothers found a buyer for Spine Solutions. Synthes, a large Swiss medical manufacturer, agreed to pay $175 million at the dealÕs closing and another $175 million if some of the companyÕs devices, including the Prodisc, got regulatory approval. In early 2005, when Synthes submitted the Prodisc study to the F.D.A. as part of the companyÕs application for approval, it used results for 162 patients who had received the device and 80 who had spinal fusion surgery. The results did not include 50 Prodisc patients who were considered Òtraining casesÓ Ñ surgeries performed to let doctors learn how to implant the devices. Such training is fairly common in device trials. A Medicare official, Dr. Steve Phurrough, said 10 percent was unusually high. While it is impossible to tell what the outcome of the study would have been otherwise, Dr. Phurrough said, Òit gives us pause.Ó The agency decided last August not to cover the disk for most Medicare patients.